Christmas is universally known as a holiday where families get together to exchange gifts and celebrate each other’s presence. For Neal Watlington, the date of December 25th holds an extra special meaning, as it marks the 91st birthday for the son of Julius and Laura Watlington. 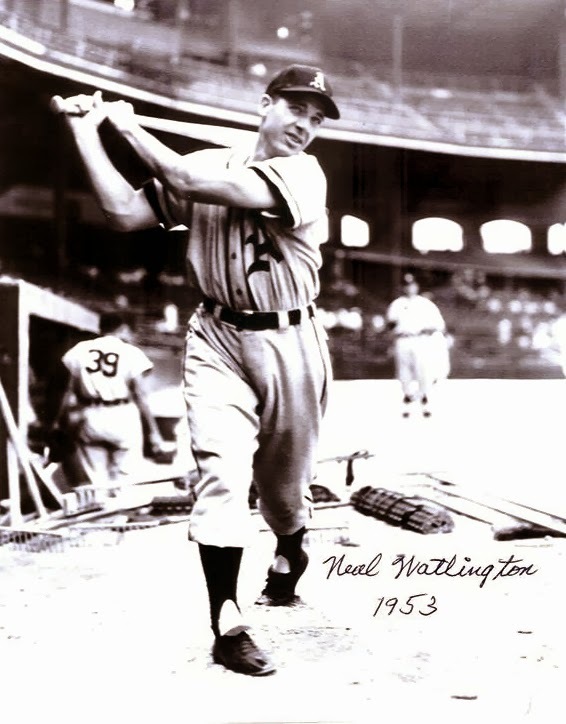 Watlington, who was a catcher for the Philadelphia Athletics in 1953, is one of 67 major league players born on December 25th, which includes Hall of Famers Nellie Fox, Pud Galvin, and Rickey Henderson. At 91, he is one of the oldest living alumni of Philadelphia’s American League team. Speaking via telephone from his home in Yanceyville, N.C. earlier this week, Watlington reflected on the auspicious start to his professional baseball career in 1941 with the Mayodan Millers of the Class D Bi-State League. “I played with them for only about a week to ten days,” Watlington said. Just as quickly as his professional career started, it abruptly ended when the team folded. It was the beginning of a long journey to an improbable major league career. Watlington waited an additional six years before had the opportunity to play again professionally, a lay-off that would be unheard of in today’s era of baseball. World War II intervened, and as a member of the United States Army, he quickly found himself wearing a different set of protective gear. Watlington earned a Purple Heart for his service, and like many young ballplayers coming out of the military, he returned home looking for a place to play baseball. At 23, he was now considered old for a prospect and with the staggering amount of players suddenly available, Watlington quickly discovered teams were looking for younger talent. He was deeply disappointed by the news. “It broke my heart,” he said. Not one to be discouraged, Watlington kept on playing with the hope that he would create another opportunity for himself. It came at an unlikely time, after a single-game elimination in a state tournament. This scout for the Cardinals was less concerned with Watlington’s age, and offered him a contract on the spot. He declined. Most players would have jumped at the opportunity, but Watlington was confident that the other teams were going to make stronger offers. Watlington once again held out, knowing deep down that he was worth more than the bonus that they were offering. Danville manager Duke Brett only needed a half-hour to size up Watlington. They quickly made him an offer. He impressed right away, batting .328 in 111 games in 1947. The Giants organization moved him to Knoxville in 1948, where he followed up with a .302 average in 134 games. After two seasons in the minor leagues, the Giants decided he was ready to be a lot closer to the major leagues, elevating him to Triple-A with the Jersey City Giants in 1949. Watlington didn’t find much difficulty with the extreme jump within their minor league system. “It wasn’t too bad, I hit pretty good in the lineup,” he said. Watlington responded by hitting .270 while splitting his duties between catching and the outfield. While patrolling the outfield, he was flanked by a future Hall of Famer, Monte Irvin. Irvin was biding his time until the Giants were ready to call him up, which Watlington said was merely a formality. While Watlington was in Triple-A proving that he could handle high level pitching on both offense and defense, he was behind Giants mainstay Wes Westrum at the catching position, as well as Ray Noble and Sal Yvars. Just like earlier in his career after returning from the war, Watlington waited patiently for another break. This one came when Watlington’s contract, along with three other players from the Giants organization was sold to Philadelphia in 1952. The Athletics brought Watlington to spring training in 1953, where he made it to the final cut down day. Dykes stayed true to his word, and after an injury to catcher Joe Astroth during the middle of the season, Watlington was a finally a major leaguer at the age of 30. “It was great to be there; there’s nothing like the big leagues,” he said. Watlington played the waiting game for almost a week before he had the chance enter a major league game. He made his debut on July 10, 1953 against the Boston Red Sox, getting a hit in his first time at bat off of Greensboro native, Hal ‘Skinny’ Brown. He started the next few games, but was relegated to pinch-hitting duties for the remainder of the season when Astroth returned. With three catchers on the club, there was little room for Watlington to get an opportunity. He finished the season batting .159 (7-for-44), and didn’t get another opportunity to return to the major leagues, spending the next five seasons at the Triple-A level until he hung up his cleats in 1958. After his playing days were over, he was a tobacco farmer in his hometown of Yanceyville and owned Watlington's Inc., a department store, and the Watlington farm store before retiring in 1999. Despite his short stay in the majors sixty years ago, Watlington remains proud of his accomplishments.